In the midst of the hustle and bustle that is New York Fashion Week, I was fortunate to spend a few hours over tea and scones at Alice’s Tea Cup on the Upper East Side with the lovely folks behind the ubiquitous Cambridge Satchel to learn a little more about the story behind the brand and their plans for the coming season. Probably like you, I initially noticed the Cambridge Satchel as it started appearing on the arms of celebrities and making the rounds on style blogs. As a girl who has a thing for businesslike bags, I was immediately intrigued, but when I realized the amazing range of colors that were available, I fell in love. 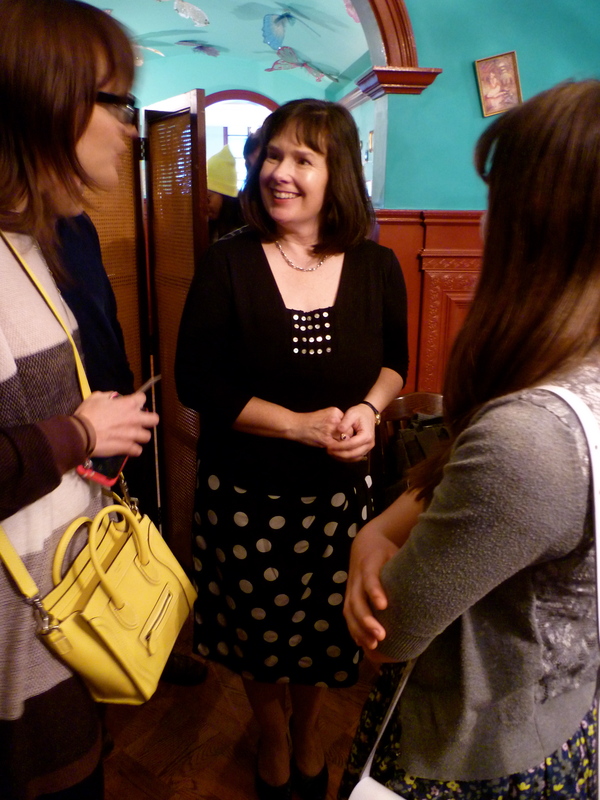 When I had the chance to chat with Julie Deane, co-founder of the company, that love was sealed. 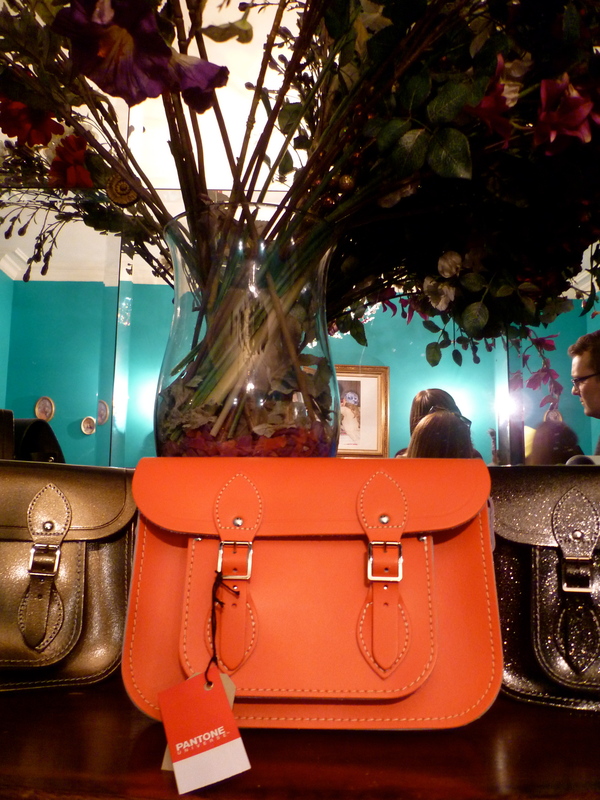 With just £600 of Deane’s money, and headquartered in the kitchen of the Deane family home, the Cambridge Satchel Company was founded so that the family could have supplemental income to send the children, Emily and Max, to a pricey private school because Emily was being bullied at school and was unhappy. With no background in how to run a leather goods company, what started out as 3 bags a week in 2008 has since grown to an outfit of almost 50 people in 2012, but has managed to retain the feeling of family at the foundation. 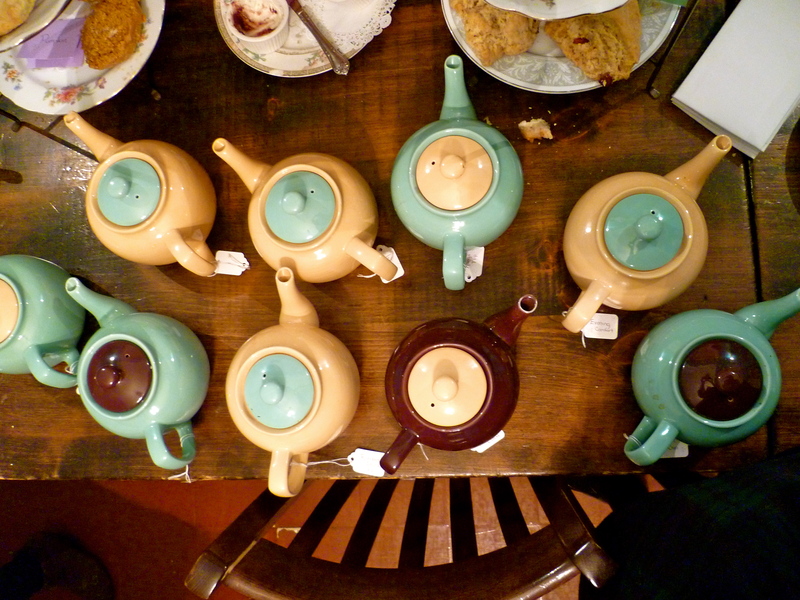 Case in point: at tea I was very pleased to meet the entire family! Mr. and Mrs. Deane, Emily and Max. Domestic production is also very important to Deane. She initially started with a local British manufacturer, but after production difficulties surfaced, Deane decided that she could do it better. So she opened up her own factory. Done! Similarly, when her embosser got backed up with embossing orders for last Christmas, she found an identical antique machine and pitched in herself. I’m reasonably convinced that there isn’t anything Deane can’t do. She is simply a wonderful lady: ambitious, gracious, optimistic and charming. As we spoke, the word “unsinkable” kept leaping to mind, as she talked about obstacles she had encountered and how she had worked hard to overcome them. She is truly an inspiration for entrepreneurs and businesswomen everywhere. 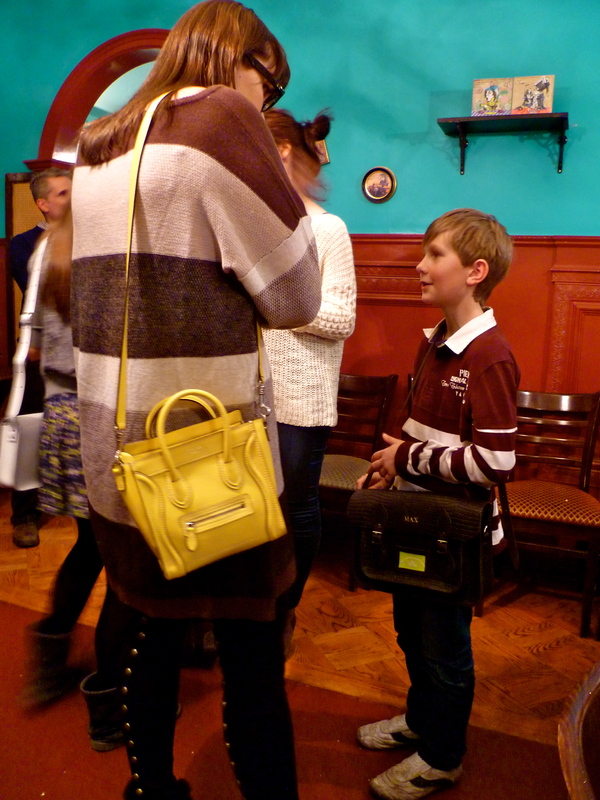 It was especially lovely to meet Max, Deane’s son, who sported his own personalized satchel, which carried his mother’s business cards and some sort of portable video game system…which he used to show pictures of all of the different bags. He even had his grandmother’s favorite satchel memorized. It was like the second coming of Alex P. Keaton, but way better. 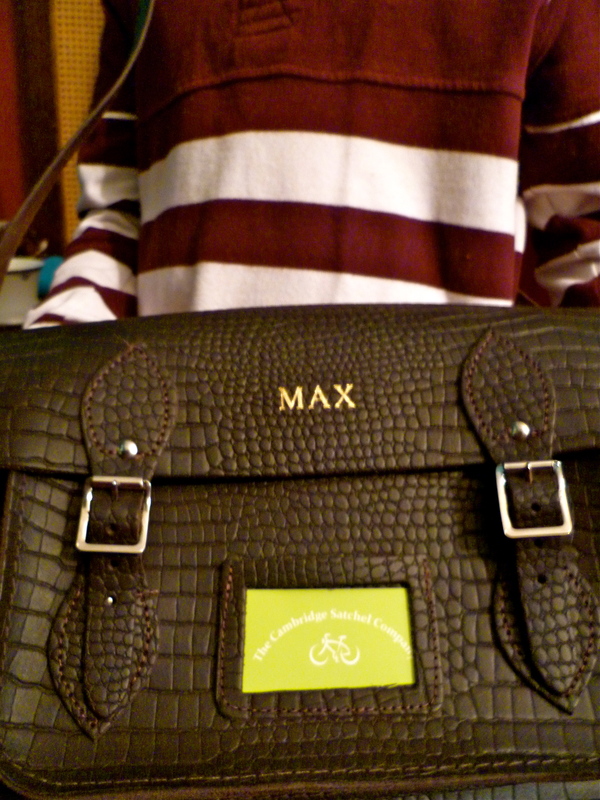 Max’s bag. Which I need desperately (with my own initials, natch). But aside from the color discussions and cups of tea, the best part of the evening was simply spending a few hours with a completely lovely bunch of people who were excited to share their story and be in New York for Fashion Week. 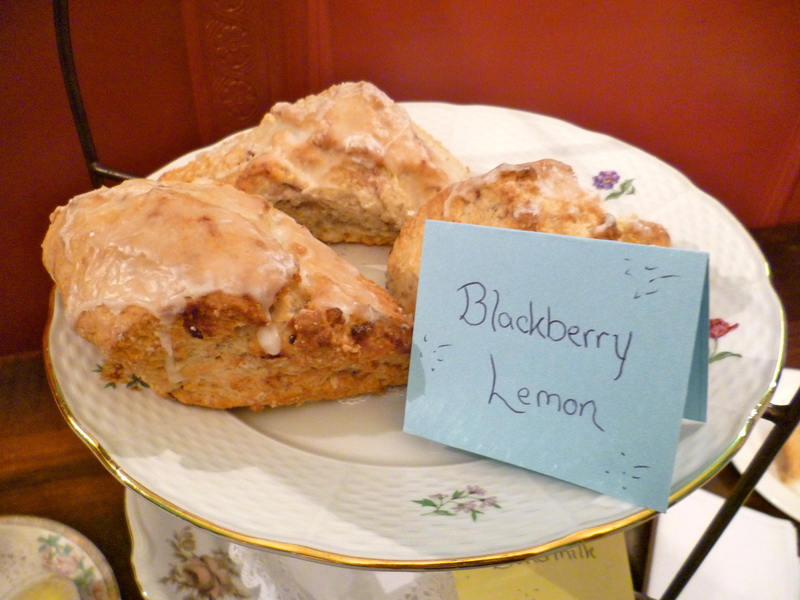 It almost felt like we had all been magically transported back to Deane’s own kitchen. 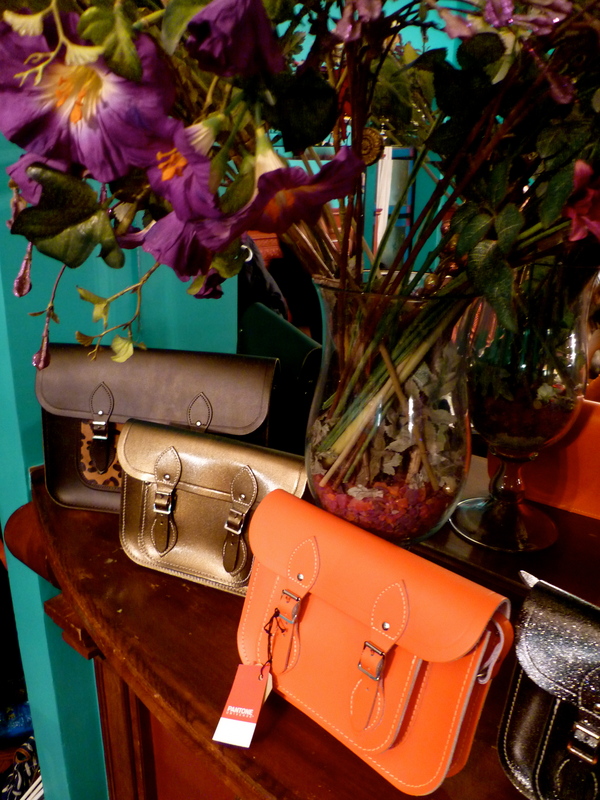 Be sure to visit the Cambridge Satchel Company. I’ve got my eye on the music bags to use as a briefcase. What a lovely behind the scenes! I’m not sure which color to recommend—maybe one of each?—but I don’t know if you can go wrong with any of them. They do have such a classic silhouette (which is fast becoming a common phrase for me. I feel like I’ve said that three times in the last day alone!). Rambling now, so I’ll stop here. Good luck picking, and have a happy Thursday. 4! I am quite jealous! Your favorite color? Wish I had one . Found it when I saw Kate Davies with a red Batchel on her back when she was posing with one of her red knitted hats. Thought to myself I have wanted one of those since I was little and saw one in an old movie (can’t remember which movie) I started to look up school bags and satchels etc on internet and Voila I found the Cambridge Satchel Co. 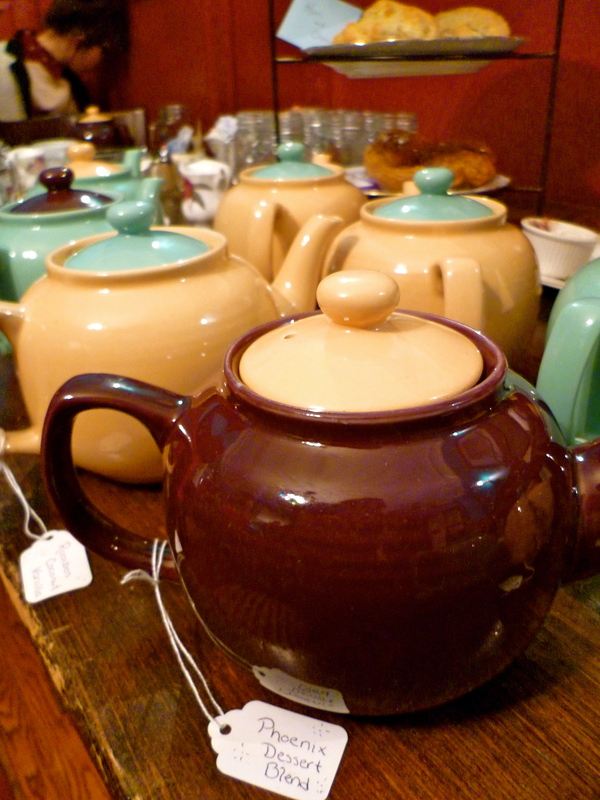 Sounds like you had a lovely tea and you certainly had a number of brown bettys to hold the teas. It was such a lovely time, indeed! 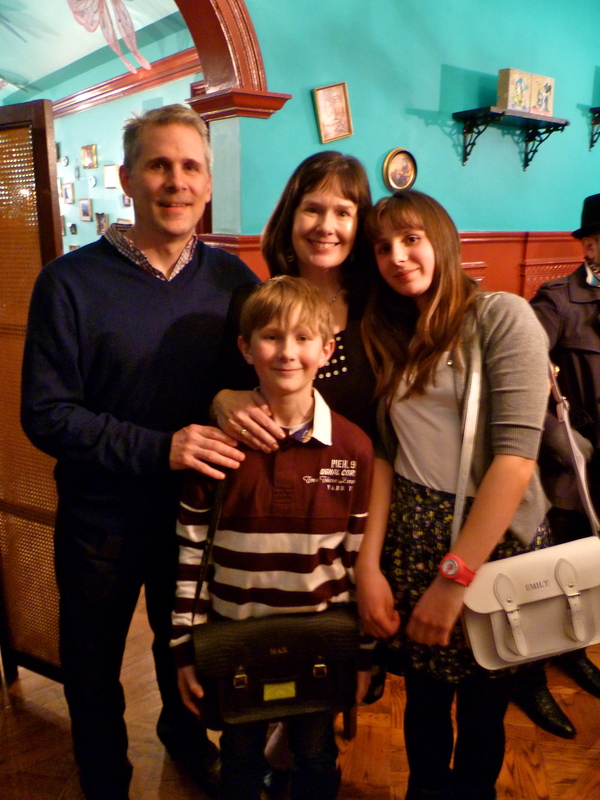 I really valued the opportunity to meet the whole family. I hope you get your red Batchel very soon! Thank you for stopping by. 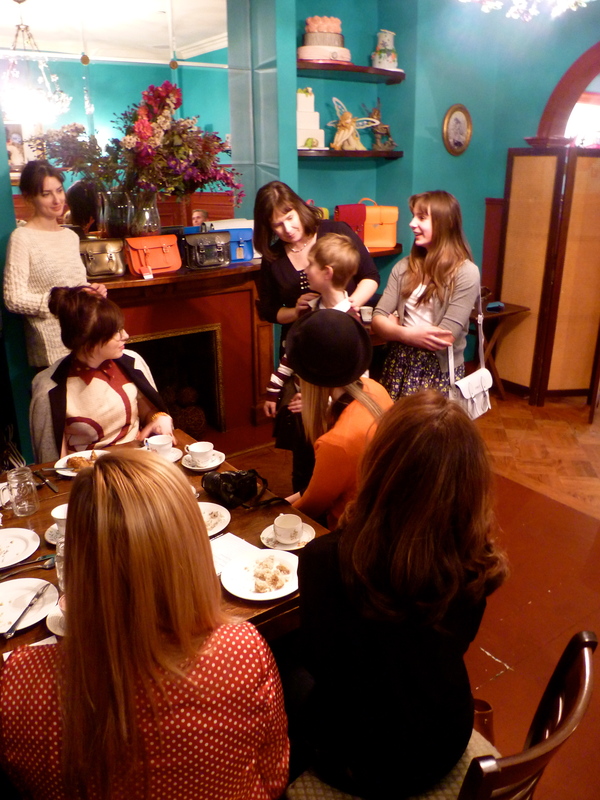 You are currently reading Tea with The Cambridge Satchel Company at Quite Continental.